The shaper formerly known as George Robinson looks too thickly alive, too vital for a man who has been planing and sanding rails for 46 years. Sturdy, Incan, hickory-haired, meaty in the hands, he takes me beneath a curtain of sea grapes into his shop and tells me he is contemplating a return to the Ecuadorian spelling of his name. In most respects, Jorge’s shaping space recalls the workshops of other master surfboard builders, with pleasant variations: where foam particles usually film the floor, feathery sawdust collects. Carpenter’s implements crowd the walls: bar clamps, scales, hand planers. Also, there is this sweet, earthy scent of wood shavings. 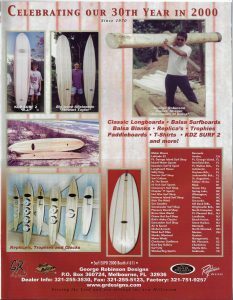 Balsa reigned during the golden age of the late ‘40s, at the nexus of the 80-pound olo and the lightweight foam blank. The glossed grain summons Edwards, Velzy, Hobie, Jacobs, and Simmons — young American revolutionaries who used balsa, along with resin and skegs, to change the way surfers approached waveriding. It was a short-lived era. By the time Grubby Clark had industrialized the surfboard industry, balsa had gone the way of purists, collectors, and folk artists. 95% of the world’s balsa is harvested in Ecuador, from forests at the base of the Andes, near the tributaries of the river Guayas. Native Ecuadorians navigated these waterways and fished from balsawood rafts centuries before the Spanish came and named the tree “balsa,” meaning “raft.” The trees (Ochroma Pyramidale) — lucent-leaved, gray-skinned — grow only in the windless doldrums, where they sprout up as quickly as weeds. Their cells are 90% water, and while they grow to over 100 feet tall, they shoot up too fast, apparently, to form tree rings. In 1972, the shaper formerly known as George Robinson opened Ecuador’s first surf shop — Mar Bravo — and became that rarest of specimens: a production shaper of balsa surfboards. Since then, he estimates he has built 2,500 balsa boards. 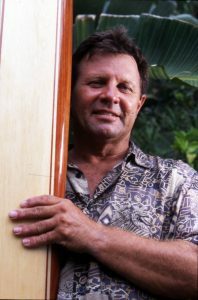 His “shaper’s tree” is simple enough: he learned the craft from Johnny Rice, who learned from Velzy, who learned from Blake, who learned from Duke Kahanamoku, who took it directly from the source. Wood has life. It is not uniform. Every piece has a soul and a history. To find the thickest, lightest balsa — La Embra, as they call it — Jorge orders his wood rough-sawn instead of milled. He takes advantage of the natural curvature of the planks to cut his rocker templates, does some mild chambering, and glues up from the T-band first, to get it true. You don’t want it to twist, he tells me. To spring. To bend. He clamps the blank together, leaves it to dry in the sun. Only then does he arrive at the starting point of foam shapers. Still, foiling the wood requires more fastidiousness. You can’t walk the board evenly, or take a screen to the rails. You need a razor-blade block plane instead of a Surform. And you must step back constantly to size it up. “But it will outlive 10 foam boards,” Robinson says. “And it won’t knee dent.” If the resin shatters, you can sand down to the bare wood and get it looking like new. The cost of a balsa board might be double the cost of a foam board, but it could very well last forever. The durability of any species lies in its ability to adapt. In this sense, it is not surprising that George Robinson is willing to take a new name so late in life. But what is he changing, really? Just the spelling — the essence remains the same. After all, they have called him Jorge in the Republic of the Equator — the stringer of the Earth — for years. The tide has gone out. It is time to give Jorge’s board a go. It cuts the water with a stiff buoyancy. No flop. No flutter. It generates an easier sort of momentum. As I take off on the first wave of the day, I feel a deepening connection to ancient, invisible traditions. There is less flex, less bounce down the face. The sensation is so simple to express: wood takes a truer line than foam. 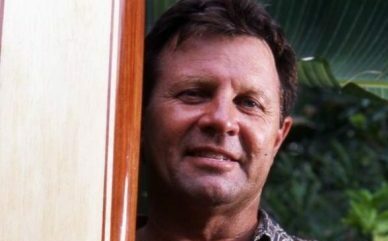 Jorge adds, “Thank you surf industry and tribe for 46 years of an epic ride! God bless.” For more information, visit www.grdesigns.com. Copyright © 2019 The Florida Surf Museum. All rights reserved. Hosting provided by Artemis.